If you can't bring the artist home; clone the performance! ArtistCloner; cloning audio experiences! We were present at the Toronto Audio Fest and what a show it was! Again we got praise from the press and public alike which can be viewed on the REVIEW page. Because of this super reception we will offer the ArtistCloner audio system of the Toronto Audio Fest with a plus value added. With the purchase of the system Sylvio Comtois will spend a weekend day and go to your audio room to set up the system to spec. Don't wait as this offer will end December 21st! Contact us for more information. We were present at the big Rocky Mountain Audio Fest! For more information visit our Facebook page with pictures and videos. Reviewed in the french magazine ted! Bench test of the SCORPI integrated amplifier and the REBEL REFERENCE speakers! Present at Classica 2018 in St-Lambert. Pictures available soon. New thicker casing, more powerful reserve capacity, OCC wiring for all signal carrying wires, new grounding strategy that results in lowered noise floor, Nickel plate finish, high capacity dual ultrafast soft recovery rectifying diodes and many more features. This amplifier has redefined audio performances and get the emotion of the music flowing. More information is available here. Nous serons présents au Festival Classica le 2, 3 et 4 juin à St-Lambert. We will be present at Festival Classica on june 2nd, 3rd and 4th in St-Lambert. As I can't stay idle with improvements I am now improving the REBEL speakers. They will have higher resolution and even better timing. They will also sport new highly durable color finish that should fit in any decor. Wow what another amazing weekend! Totally off the top and exciting! Again our crew had the pleasure of being invaded by wave after wave of mentions of excellence. Thank-you to all who came and enjoyed the great time with us. 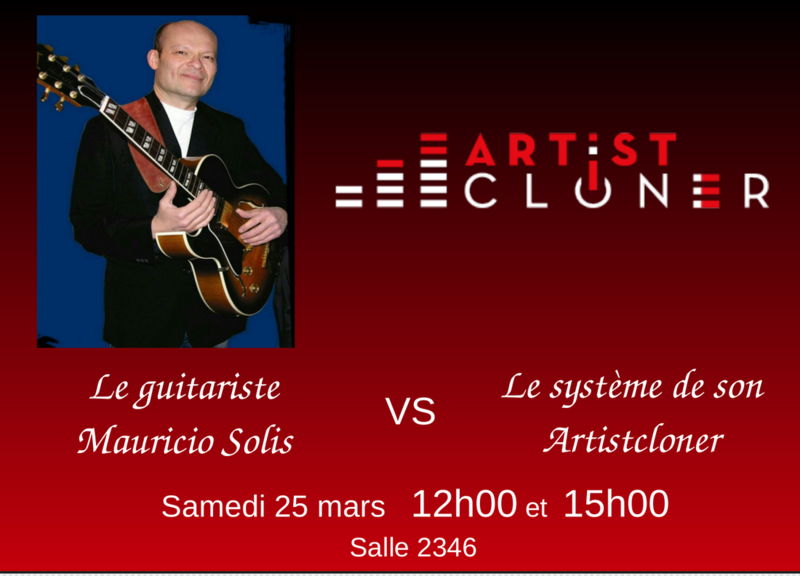 Venez assister samedi le 25 mars, à l'hôtel Bonaventure au défi d'un artiste VS le système de son ArtistCloner! Chambre 2346. Unveiling of a new reference speaker The REBEL and the SCORPI inegrated amplifier for 2017. Details will follow of this great product. We now include a remote volume control for the Ascent preamplifier at the same selling price and upgraded audio path resistors. Enjoy the music SSi 2016 just added! A new section for great prices on demo products or prototypes that will not go to market for one reason or another. These are great products and we only sell what is good and not our waste basket. Sell-off! page. After popular demand, work has started on the design of an integrated amplifier. This being a one box design will bring cost down and give approximately 80%-85% of the performance of the Ascent Mono Blocks as seen at the Montreal SSI 2016. We strive at bringing the best value for our quality products and will continue to do so. Due to fortunate circumstances ArtistCloner has reduced its prices over all. For those who have bought at the old pricing will either get a reimbursement of the difference or a credit towards future purchases. You will be contacted if you are in this category. Good news for the working music lover! Copyright © 2018 ﻿Prices subject to change without notice. ArtistCloner ​All rights reserved​.